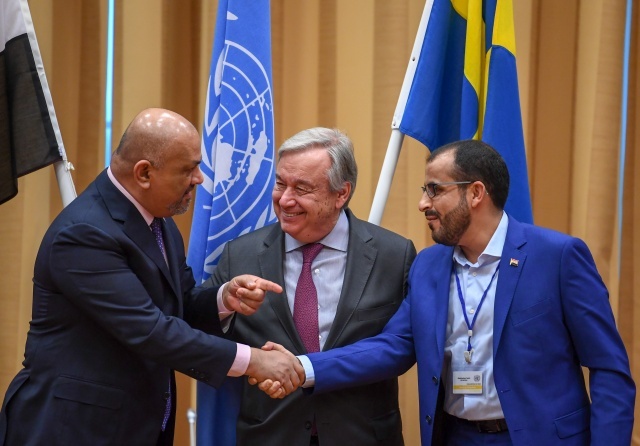 Yemen's foreign minister Khaled al-Yamani (L) and rebel negotiator Mohammed Abdelsalam (R) shake hands under the eyes of United Nations Secretary General Antonio Guterres (C), during peace consultations taking place at Johannesberg Castle in Rimbo, north of Stockholm, Sweden, on December 13, 2018. (AFP) - Yemen's warring parties on Thursday agreed to a ceasefire on a vital port in a series of breakthroughs in UN-brokered peace talks that could mark a major turning point after four years of devastating conflict. If implemented, the deal on the Hodeida port, a key gateway for aid and food imports, could bring relief to a country where 14 million people stand on the brink of famine. In a highly symbolic gesture on the seventh and final day of the peace talks in Sweden, Yemeni Foreign Minister Khaled al-Yamani and rebel negotiator Mohammed Abdelsalam shook hands to loud applause -- although both later voiced scepticism. The two leaders gave contradictory readings of the Hodeida deal shortly after the announcement by UN chief Antonio Guterres. The week-long talks left a number of key issues unresolved. A new round of talks is scheduled for the end of January, with analysts predicting the US will continue to up the pressure on ally Saudi Arabia, a key backer of the Yemeni government, to end the conflict. Impoverished Yemen has been mired in fighting between Iran-backed Huthi rebels and troops loyal to President Abedrabbo Mansour Hadi since 2014. But the war escalated in 2015 when a Saudi-led military coalition stepped in on the government's side. Under the Hodeida agreement, released on Thursday evening, an "immediate ceasefire" should come into effect in Hodeida and its three ports upon signing, followed by a "mutual redeployment of forces... to agreed upon locations outside the city and the ports". The UN will play a "leading role" in management and inspections at the ports, for four years under rebel control. The port will eventually be under the control of "local security forces" -- a term the rival parties disagree on. Yemeni Foreign Minister Khaled al-Yamani, who agreed to the deal in Sweden, declined to specify whether the forces would be solely state security forces but told AFP they would report to the "central authority" -- the government. But the head rebel negotiator told AFP the phrase referred to the "security forces currently present in Hodeida" -- the rebels. Saudi Arabia and its allies accuse the rebels of arms smuggling from Iran through Hodeida and the capital Sanaa, charges Iran has denied. The Saudi led-military coalition currently controls Yemen's maritime borders and airspace. UN chief Guterres said the rivals had also reached a "mutual understanding" on Yemen's third city of Taiz, the scene of some of the most intense battles in the conflict, to facilitate the delivery of aid. No further details were given. No deal has been reached on the future of the airport in the capital Sanaa or on economic measures needed to spare the population from further hunger. Sanaa airport has been closed to commercial flights for nearly three years. The airport will be discussed at the next round of talks, UN Special Envoy Martin Griffiths said. Foreign Minister Yamani said the deal was the biggest step forward since the outbreak of the war but remained "hypothetical". "We will wait and see," he told AFP. The rebels' Abdelsalam told AFP his group was "bound by an agreement". US Secretary of State Mike Pompeo was upbeat, saying "peace is possible". "The work ahead will not be easy, but we have seen what many considered improbable begin to take shape," he said in a statement. "The end of these consultations can be the beginning of a new chapter for Yemen." Analysts said the Rimbo talks progressed better than anticipated, two years after the last negotiations hosted by Kuwait in 2016 collapsed with no breakthrough after three months. "The Sweden talks have achieved more than anyone expected," the International Crisis Group told AFP. "We have heard a different tone from the government of Yemen in these talks, and US pressure has clearly focused minds in the Gulf." The case of murdered Saudi journalist Jamal Khashoggi, along with the humanitarian crisis in Yemen, were the turning point for the US. The US, Britain and France are still the biggest arms suppliers to Saudi Arabia. Both the rebels and government alliance are accused of failing to protect civilians. The UN last year blacklisted the Saudi-led coalition for the killing and maiming of children in air raids. The US Senate on Thursday approved a resolution to end American backing for the Saudi-led intervention. The largely symbolic resolution cannot be debated in the House of Representatives before January, and would likely be vetoed in any case by US President Donald Trump, who has repeatedly signalled his backing for the Saudi regime. Saudi Arabia and its Arab coalition partners "strongly support" the agreement, Riyadh's US ambassador Khalid bin Salman said, while Iran hailed the breakthroughs as "promising".